It was Royal Wedding Fever at Bread Church on 17th May as we looked forward to Harry & Meghan's big day in Windsor. A bread cake was baked complete with bride & groom on the top and candles. Two of our community agreed to be Harry & Meghan for the day and walked down the aisle, blew out the candles, cut the bread-cake and then joined the guests for our usual amazing soup and bread lunch. But this time we had cakes and sweets to finish off the lunch, as well as bunting festooned around the church. We hope and pray that the real bride and groom had as much fun on Saturday as we did on Thursday. In reflections we talked about the story of the Wedding Feast at Cana and how the guests had reacted to a lack of wine that needed Jesus' help. Hopefully no such difficulties were had at Windsor on Saturday. On Tuesday, 24th July, the community here at Somewhere Else welcomed a group of visitors who had travelled down from Gateshead; to experience our "outrageous hospitality". Rosemary, Mike, Norma, Julie and Georgia May learnt about the work that we do here and enjoyed making bread to share with the people of Liverpool - including bemused workmen in hard hats! They were ably assisted by our facilitator volunteers Peter, Cindy and Jess. You can see their amazing loaves in the group photo, which also includes Peter. Steve's funeral was held at Kensington Methodist Church , followed by a tribute where friends and family were invited to share their memories of Steve. "I've never experienced such a warm and loving tribute as that given to Steve, It was heartfelt, genuine and real to the person he was, he'd have loved it", Mandy Clynick. The community has created a 'Memories of Steve' board at the Breadchurch where we've shared our memories of Steve. Everyone is welcome to add their 'memory' to the board. Also, many many people wrote tributes to Steve. Through the next few weeks we are collecting tins of beans and tuna for Kensington Community lunch. If you can help our collection of beans and tuna get higher up the wall then please bring what you can to bread church each Tuesday and Thursday. Let's see if we can reach the ceiling by Christmas!!! Saint Lucia's Day, or St Lucy's Day, is a Christian feast day celebrated to commemorate Saint Lucia, a 3rd century martyr. The day is celebrated in Scandinavia. so Joseph, our Norwegian Vincentian Volunteer, told us her story. He also told us how they mark St Lucia's Day in Norway. We had great fun making St Lucia buns and they tasted a treat. They're very soft with a delicious Christmas spice flavour. Everyone who wanted some took some home. And then the process can take over…. To support the Methodist Church week of fasting, we won't be sharing or eating bisuits for the week. It's always nice when people bring in biscuits to share, but for this week, we'll put them away until our "fast" is over. We are delighted here at Somewhere Else, to have been asked by the Liverpool Central Library to put on an exhibition of poetry and writings that the community have been doing with our friend and creative writer, Carole Benn. The exhibition runs throughout September 2017 and is located on the first floor of the Central Reference Library in William Brown Street, Liverpool. Just go up the escalator to the first floor and turn right. We are just past the enquiry desk, near to the entrance to the Picton Reading Rooms. On the opening night we distributed freshly made bread to the visitors in the library and had some wonderful conversations with those who came to view the exhibition. Heather reports, "Tucked away in a quiet corner on the first floor with not much traffic at that time of night Carole, Andrew, Toni and I decided to bag up the rolls with the information inside and take our 'calling card' around those still at work. Very well received I must say. We had a good chat with those that ventured over to look as a result and I hope over the month many more people will come to look, read and pick up the information"
Please come along and see the exhibition and let all your friends know about it. We wish Lorraine the very best as she begins her work as Administrator at Somewhere Else. She said, "I'm looking forward to joining you at the Bread Church, I'm a novice at bread making so as well as working in the office, I look forward to improving my skills with all the experts here." In the picture she's kneading her dough to make a granary loaf. It turned out beautifully, the first of many we hope! Vinnie met Milly at the Bread Church over a year ago. As they got to know each other, they became good friends and recently decided to get married. Milly, who is already a facillitator, is pleased that Vinnie has decided to join the team and enrol on our training course. We wish them both the very best for the future. There’s a sign up list on the bulletin board in the Main Breadmaking Room to help us with catering numbers. Alternatively, you can call Toni Poole in the Somewhere Else office on 0151 706 0155 or send a text to the Minister's Mobile 07546 474598 if you would like us to add your name on the sign up list. Breadmaking and worship resume on Tuesday 12 September at 10:30 AM. Many thanks for all of your continued support and love! Toxteth Town Hall recently hosted the inaugural 'Heroes and Sheroes of L8' celebration, to recognise the unsung who make a difference to community life in Liverpool. Rev Ian Hu, our minister at the Bread Church, and Frances Phillips, one of our regular bread makers and worshippers, were selected as part of a group of community leaders presented with badges of recognition by Louise Ellman MP. Ian was nominated by Martin Zopa Huiskens, a facilitator at the Bread Church. He writes, "Authentic leadership is rare in our community, particularly with many men who tend to wear many masks. One of my inspirations for authentic leadership is Ian Hu because he is openly himself... (and) is honest about... his Christian faith." Martin continues, "I have read about many leaders from the past, like Issan Dorsey, the Zen Buddhist monk whose biography 'Street Zen' was a real inspiration. As a Buddhist, I did not expect to find similar authentic leadership in a little Methodist church in Liverpool! See, Christians can be cool, Christians can inspire and provide authentic leadership. The 'Somewhere Else' church is a place of refuge for me. I feel safe there. May you continue to do your work for our community in Liverpool and beyond." 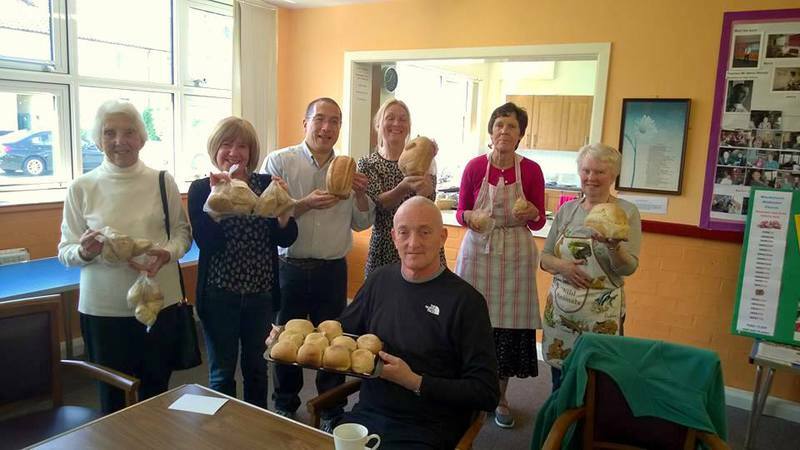 Ian writes, 'This recognition is 100% the result of the time and energy of all of our volunteer facilitators at The Bread Church who make our Tuesday and Thursday worship expressions come to life through the making, baking and sharing of bread. Without our volunteers, The Bread Church would cease to exist... they are the TRUE HEROES AND SHEROES!" 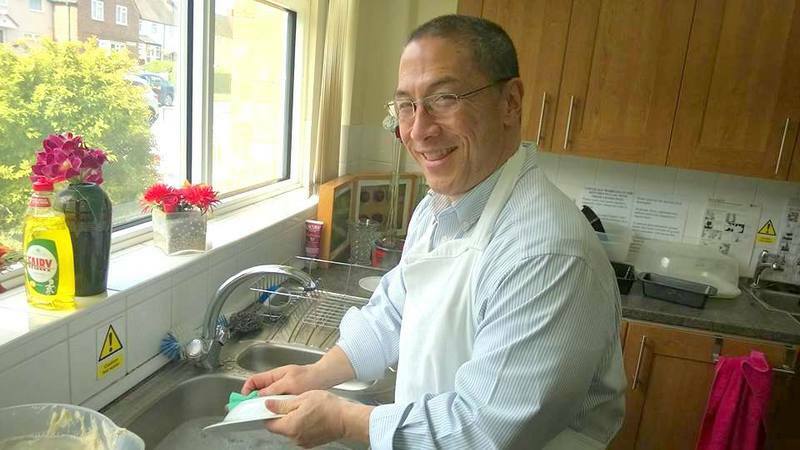 Our minister, Rev Ian Hu is now back from his sabbatical and he was made very welcome by everyone. We'd like to thank all of the guest chaplains who provided excellent support while he was away. 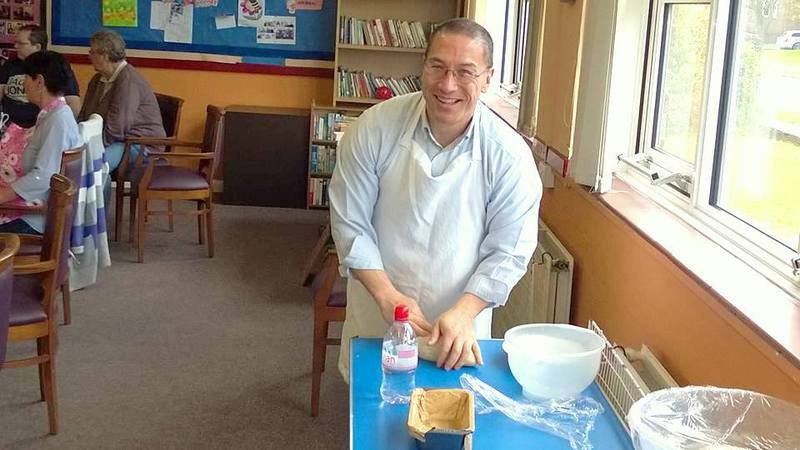 Ian recently visited Woodchurch Methodist Church in Birkenhead where he shared some of his Sabbatical time with their baking group. Peter. one of our facilitators, said, "(It was) an honour and blessing to have him with us. God be with you Ian in everything you do. Monika was a popular facitator at the breadchurch. She was a Vincentian Volunteer, someone who takes on the responsibilty of supporting the Minister and Administrator. And Monika rose to the challenge in so many ways. We wish her all the very best for the future and look forward to her visiting us soon. Thank you Monika for your hard work, your caring nature, your sense of fun and of course, your delicious soup! Congratulations to Mollie, Joanne, George and Monika on completing their facitlitator training. It takes several months and hard (but enjoyable! ), work to complete the training. We all enjoyed a wonderful presentation ceremony to celebrate their achievement. Also a huge thank you to Heather for running the course and presenting the certificates. 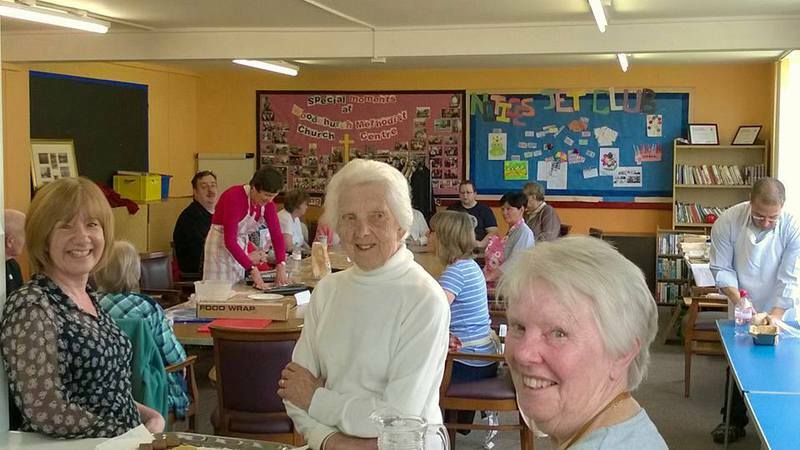 Methodist Women in Britain enjoyed their breadmaking day! A small group from the MWiB gathering in Liverpool came to explore ways of "looking at church in unfamiliar ways" by making bread with us. As well as making bread the group learnt about the history of the bread making community at Somewhere Else and an opportunity to sample our “outrageous hospitality”. Many felt that the opportunity to make bread in a warm, dry and welcoming environment was infinitely preferable to “looking at church in unfamiliar ways” by walking the streets of Liverpool taking photographs in the pouring rain!! Our thanks to the little band of bread-makers who baked such wonderful bread.